For 2 years now, the Ferme de Tayac has been the choice of accommodation for people from all around the world. Ferme de Tayac, a lovely 12th century former farmhouse / monastery in the hart of the Vezere Valley, just 5 minutes walk from Les Eyzies. For hundreds of years the Ferme was occupied by the monks, who also farmed the land around it. 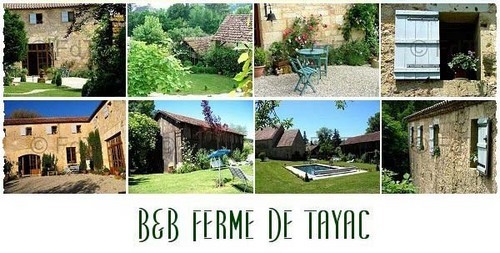 In 2001 Suzanne & Mike purchased Ferme de Tayac after it had been unoccupied for over 10 years. It was in a sorry state, and was deemed dangerous and a hazard. It took Suzanne & Mike 7 years to bring the Ferme back to it’s former glory. With among other things, metre thick walls, rooms built into solid rock, oak beam structures, and bedrooms in former monks quarters make the Ferme a special and very unique place to stay whilst visiting the Dordogne, and it is not hard to see why Ferme de Tayac has been the travellers choice of accommodation for 2 years.